Forsskål’s philosophy dissertation was first published in Göttingen in June 1756 as part of the process of examination of his thesis. The publisher was the Dutch bookseller-printer Élie Luzac who had been asked by the University to open an office in Göttingen in 1754. Luzac , like Forsskål, had an interest in questions of freedom of speech and in 1749 had published an Essai sur la liberté de produire ses sentimens in Leiden. A second edition of the Dubia was published in Leipzig, probably also in 1756, by Gottfried Stopffel who worked there from 1745 to 1759. A third edition was published in Copenhagen, probably in 1760 when Forsskål was in Denmark preparing to join the expedition to Arabia Felix. The title page announces additional notes and supporting pieces, many of which document the scholarly reaction to the thesis and Forsskål's response to criticisms. The printer of this edition was the widow of Ludoph Henrik Lillie who had worked in Copenhagen from 1755 to 1758 and was succeeded by his widow from 1759 to 1765. On the title page of this third edition, Forsskål announces himself as professor of philosophy at Copenhagen and a corresponding member of the Academy of Sciences in Göttingen. A draft of the diploma for the award of the status of Corresponding Member survives in the Archive of the Academy of Sciences, dated June 1756. B. C. D. Dubia de principiis philosophiae recentioris quae cons. ampliss. ord. philos. 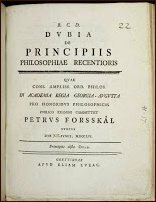 In Academia Regia Georgia-Augusta pro honoribus philosophicis publico examini committet Petrus Forsskål Suecus Die [ ] Iunii, MDCCLVI. 4°: *6 A–G4 H6, 36 leaves; ,  2–65  pp. B. C. D. Dubia de principiis philosophiae recentioris quae cons. ampliss. ord. philos. 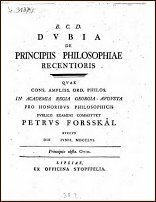 in Academia Regia Georgia - Augusta pro honoribus philosophicis publico examini committet Petrus Forsskål Suecus die [ ] Iunii, MDCCLVI. Lipsiae, ex officina Stopffelia, . 4°: * A–H4; 36 leaves; ,  2–64 pp. Petri Forsskål, Sueci, prof. philos. Hafniensis et corresp. soc. scient. Götting. 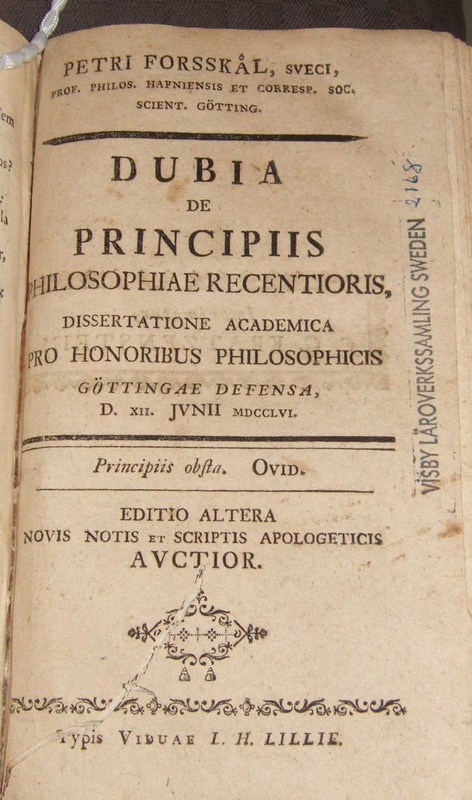 Dubia de principiis philosophiae recentioris, dissertatione academica pro honoribus philosophicis Göttingae defensa, d. XII. Junii MDCCLXVI. Editio altera novis notis et scriptis apologeticis auctior. [København], typis viduae L. H. Lillie, . 8°: π1, A–M8, 98 leaves; ,  2–4 [5–17] 18–110  112–180  182–192 pp. Shelf mark: Rv Diss. ulk.